Vintage (and Magic in general) has been in a bit of a snit recently as players discuss the implications of the London mulligan, which will be tested at the upcoming Mythic Championship II. If the test goes well, the new rules would replace the current Vancouver mulligan rules. In brief, the London mulligan has players continue to draw seven cards for each mulligan and then put a card on the bottom of the library for each time they’ve mulliganed. So if you mulligan twice, you’ll draw seven cards, pick your five favorite, and put two cards on the bottom of your library. We’ve tested with this a few times in Middle School and Vintage pickup games, and it hasn’t made a huge amount of difference in most games. Where you’re keeping seven or six cards, for example, it’s equivalent to the current, or nearly so. At more than four mulligans (keeping three cards or fewer), you’re still so far behind on materiel that your chances are vastly depleted, even if you keep a solid looking trio or pair of cards. So the real test seems to be in keeping four or five cards, where you might have a powerful way to recover—Ancestral Recall, or Workshop-Trinisphere for example. Regardless, even with this potentially strengthened mulligan rule, we don’t think you want to mulligan. Cards are just too powerful a resource. So we don’t think this will be too-too upsetting for Eternal formats. In reality it will just make players feel better when they have to mulligan a long way down. But! In any case, it would be a shame if Mishra’s Workshop or Bazaar of Baghdad to be restricted based on a mulligan rule change, since they’ve been vibrant parts of the metagame for so long. 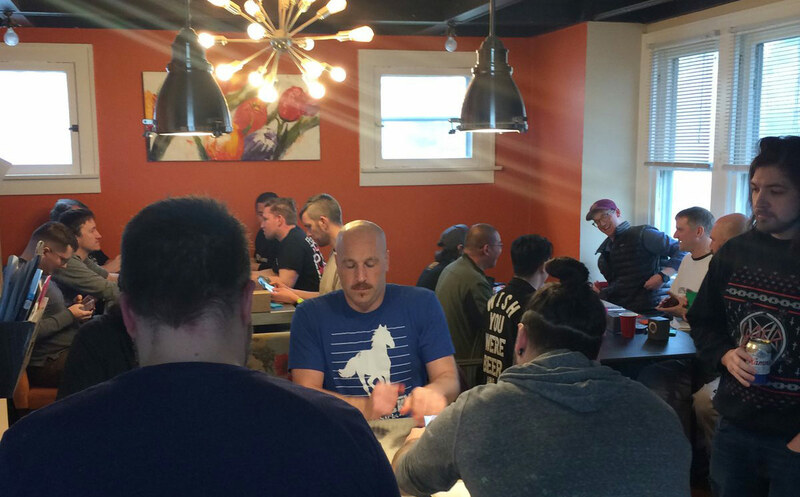 A couple weeks ago 29 players showed up at the home of Matt Hazard in Columbus, hungry for the competition of a Vintage tournament and the fun of a casual environment. For an average suburban house, that’s a lot of people, particularly if you need them to have enough room between them to comfortably play a game of Magic. Matt and his wife, Trece, have hosted a similar event for four years in a row now, growing in scale each year. The first few years they had three dogs and two cats, and now they have a young kid to contend with among all the hubbub. And they do a great job! 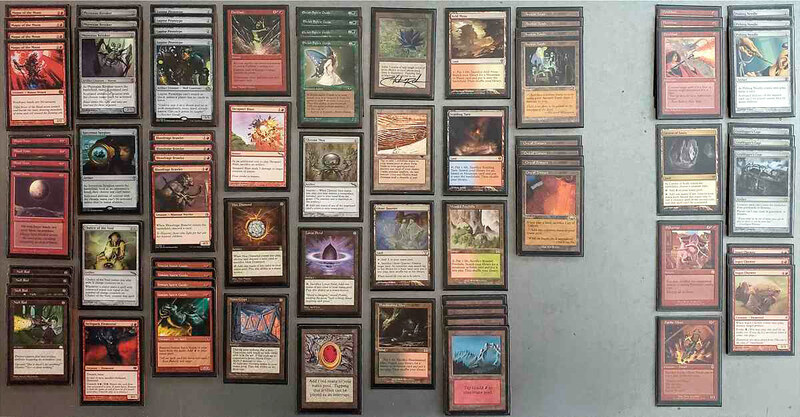 This is one of the Ohio Vintage community’s favorite tournaments. There are so many things to take into account if you want to host a similar event, but it can be done. Aspects include: seating, tournament organization, food and drinks, and prizes. The first thing Matt suggested was making sure you have enough places to put the games. His dining-room table only seats six, so with 23 more players to fit, we were spread out at the kitchen island (4), another table in the dining room (6), the living room (4), and the basement (8), including games on an ottoman and some borrowed folding tables. Knowing how many players you’ll be serving gives you a sense of scope for the event. Be realistic about how many you can host, and be firm in capping the event if necessary. It will be more than uncomfortable to cram players in where there’s not actually enough room for them. Then you need to put all those players into some sort of tournament organizer software. Wizards Event Reporter is the “official” software but shouldn’t technically be used for events with playtest cards. Plus everyone in WER needs a DCI number. We are more likely to use MtG Arena (not the online MTG game), which is free and uses the same algorithm to calculate player rankings. It requires only a Google ID to login, and the only difficulty is that it’s hard to re-pair if something gets off mid-round. You can print off pairings, or put them on a big TV, or just shout them out. For smaller events, a little yelling never hurt anyone. I’ll also recommend knowing and making clear how many rounds will be played and how a winner will be determined, so there’s no confusion toward the end. Typically you play N Swiss rounds for P players, where 2N – P isn’t negative. So 3 rounds for 8 players, 4 rounds for 8 to 16, 5 rounds for 16 to 32, and 6 rounds for wow, you have a lot of friends. There are plenty of options to determine a winner: Swiss and elimination rounds (usually top-eight for more than 16 players), Swiss+1, or – as Josh suggested for small events – round robin. The Hazardvitational and other events at peoples’ houses (like TSI Steveland, which we talked about recently) have asked players to bring their own drinks. It helps make sure everyone has something they like and takes a lot of burden off the hosts for supplying. Team Serious tends to go through a lot of Jägermeister, Malört, and Hamm’s because we hate ourselves. This year we even imported the “Dressed Hamm’s” from Chicago, which is better than it sounds, really. Our home-based events have also typically included a break in the middle of the event for food. The Hazard’s had everyone throw money in a bowl for a big pizza order from Columbus-area favorite Donato’s, ending up with 15 large pizzas in all (almost half a pizza per person). Geoff’s invitationals have ordered in subs or burritos from Jimmy John’s or Chipotle. Coordinating a big grill-fest of burgers and hotdogs has worked as well too at events, in part because someone who’s not playing can serve as grillmaster. Regardless, food helps ground everyone and is another event people can socialize around. And of course there are prizes to think of. Some Team Serious Invitational series have traditional prize structures that ask for entry fees and then condense those to pay out to the top four or eight players. This can be tricky since the prizes have to be bought in advance with a prospective amount of money based on the number of confirmed players. Often players or teammates are interested in selling cards to this venture, but you have to hope that the right mix of cards comes available at the same time as the money or risk over- or under-spending for prizes. The Hazardvitational bypasses this hangup by skipping the entry fee and asking players to donate prizes, suggesting a value of $20 or more. 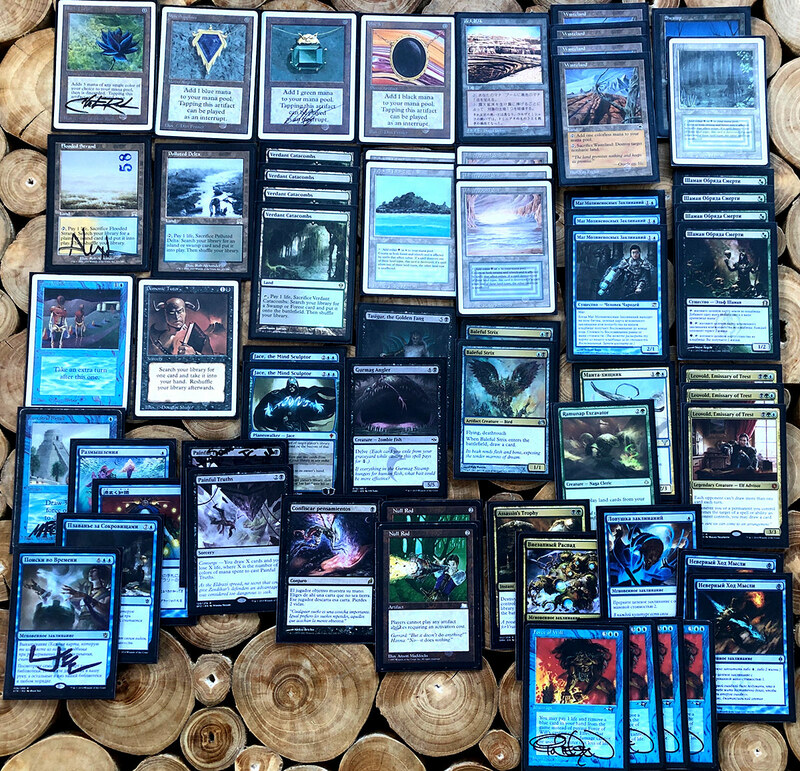 Cards are frequent additions to the pool, and we’ve had things like Dual Lands, Jaces, Commander decks, complete sets, and various user-created packages. Jake Hilty put a complete Middle School deck in the pool for this event, which was awesome. We’ve also had non-Magic prizes like alcohol (including Josh Chapple’s prize of bitters and a cocktail recipe book) and even a Sawzall, which went highly in the structure. Recent additions to the prize pool have been “mystery box” prizes, which are pretty much what they sound like. The sky’s the limit, and part of the prize is the fun of opening an unknown quantity. Ben Perry consistently outdoes himself in this category, as this year’s “Do Not Open” box included a choice of keeping a Tundra or one of two further mystery packages. The chosen prizes were intended to be given to other players of the winner’s choice and turned out to be more Middle School cards. In the end there are lots of ways to put a home tournament together. These are just basic ideas, and you can feel free to modify as necessary. 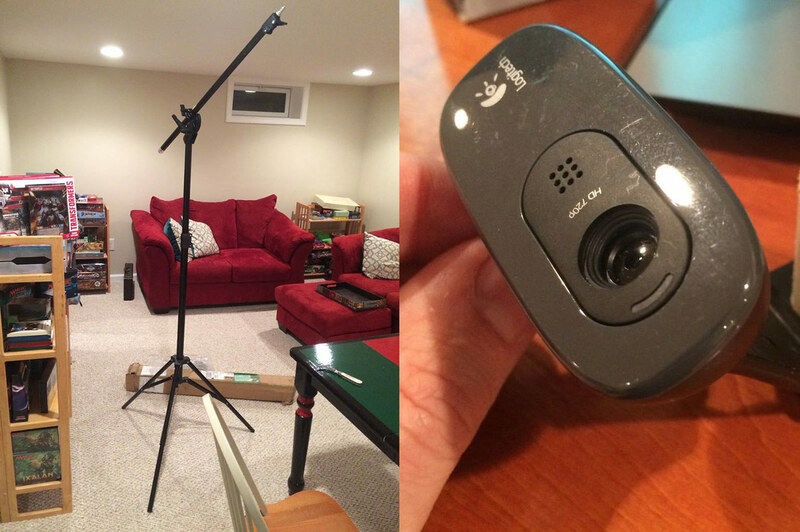 I also didn’t get a chance to mention this in the podcast, but I devised a much-improved streaming rig for holding a camera above a game of Magic. Instead of using two vertical posts with a crossbar, I got a boom stand with a single counterweighted arm, like this. What an improvement! The stand can be put to either side of the table, or even behind one of the players, and is so much stabler than the previous crossbar. I was able to glue the camera to a section of dowel and use the protective cap as a method of attachment to the end of the boom, so the camera screws on and off and angles can be adjusted. I didn’t have sand to weigh the bag, so obviously I used basic lands. I’m really pleased with this new setup and am looking forward to using it in the future. In the last episode we talked about an upcoming (now past) Old School event run alongside Magic Fest Cleveland, hosted by the Cleveland Rocs at BottleHouse Brewery and Mead Hall. The event ran smoothly, everyone had a great time, and the event organizers were able to donate more than $1,700 to Providence House, a Cleveland-area family crisis center. This episode we talk about contacting Land Grant Brewing to help us make a more fun event by providing fine liquid refreshment to players. Josh Chapple operates under a policy of “Don’t ask, don’t get,” so he asked and we got. 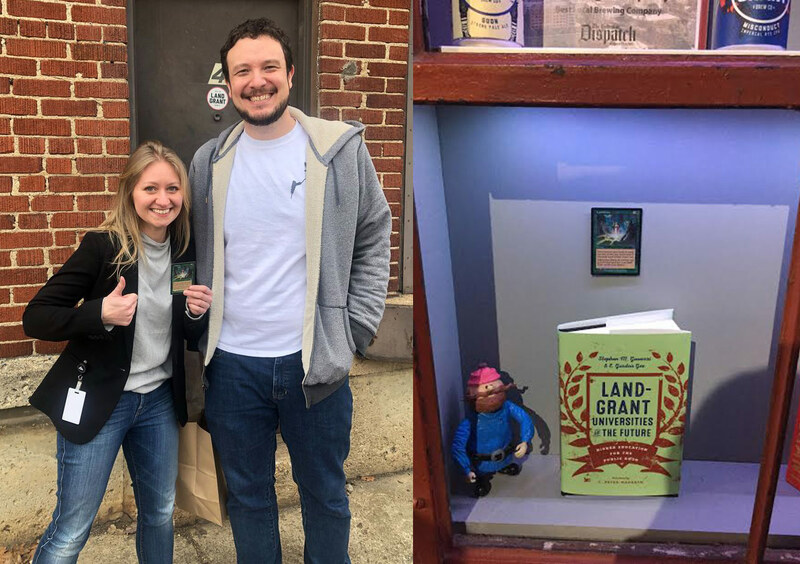 In this case we told them that Land Grant is actually a Magic card, and they asked for one for their trophy case. A fair exchange, for sure. There’s a lot of power in the Magic community, even among smaller groups like local Vintage or Old School scenes. Charity events are wonderful opportunities to combine the people-power and (let’s be honest) money inherent in these groups and put them to good use. It’s an attempt to make a difference where it’s needed. So many Magic events are inward looking, with players essentially giving back to themselves. Charity events are outward looking, good for everyone involved. Following the Hazardvitational, we contacted Land Grant again to set up what I hope will be a longer-term relationship, presenting the opportunity to do a similar charity event to the Cleveland Rocs partnership with BottleHouse. Magic players get a place to play and a chance to help out their community, and a local business gets a similar chance to give back, some promotion, and a captive audience of consumers for an afternoon. Land Grant was excited about the option, even offering to donate 20% of their day’s profits to the charity as well. Sounds pretty win-win-win! I’m really excited about this, hoping we can match the Rocs’ results. Right now we’re looking at an event on May 18, with more details to come. Look forward to it! So What Happened at the Hazardvitational? Jaco won the Hazardvitational playing four-color Paradoxical Outcome, beating David Lance on Survival. Other Top 8 decks were Ravager Shops, Paradoxical Oath, Humans, Grixis Xerox, and Griselbrand Oath. You can see these lists as well as plenty of photos from the event on The Mana Drain. Enjoy, they’re fun! 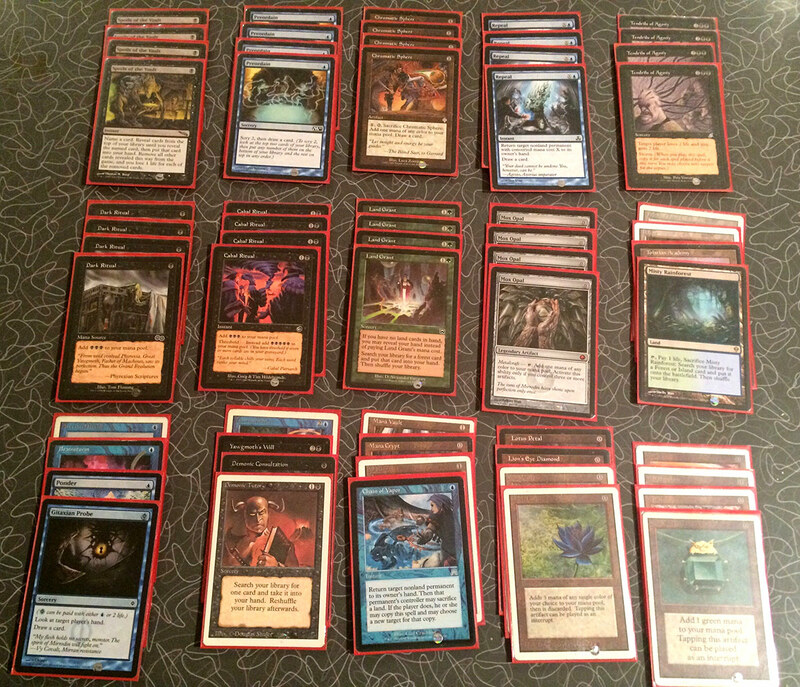 Matt Hazard, our gracious host, played a mono-red aggro control deck with lots of Blood Moon effects and Null Rods. The idea is very much to hinder your opponent’s mana, empty your hand, and attack with aggressive creatures like Lupine Prototype and Bloodrage Brawler. Not one to shy away from interesting cards, he also included a maindeck Hellspark Elemental and a sideboard Pardic Miner, which gets talked about in the audio. I’ll let you look them up. Josh Chapple played his usual: BUG Control. It’s a typical looking list, one that you hope is metagamed properly for the event you’re playing. That’s difficult at a lot of Team Serious events where you might face Matt Hazard Mono-Red or a deck that includes a bunch of cards with “Predator” in the name so it can coordinate with the player’s donated prize. Anyway, when the right answers for your opponent’s strategy find their way to you in time, your game will go well. Otherwise, it’s a fun battle. I played Turn-One Tendrils (a.k.a. SX or Meandeck Tendrils), a deck that’s more of a thought experiment than an actual competitive deck. There has been much written about the archetype, but it doesn’t show up because it’s weak against so many kinds of disruption and is tricky to play well, let alone perfectly. I had fun and had a lot of time to eat and talk to people and hang out between rounds. I died once to Spoils of the Vault. 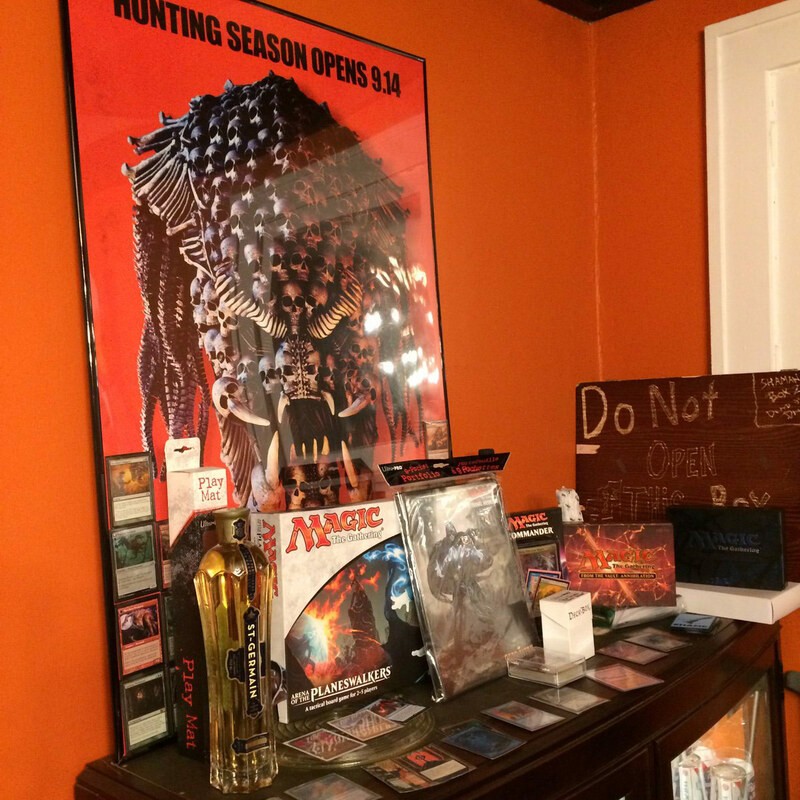 What’s the best prize you’ve ever won playing Magic: The Gathering? Would you rather have a known prize or a mystery box? Would you have guessed 30 people would each eat an average of half a pizza? 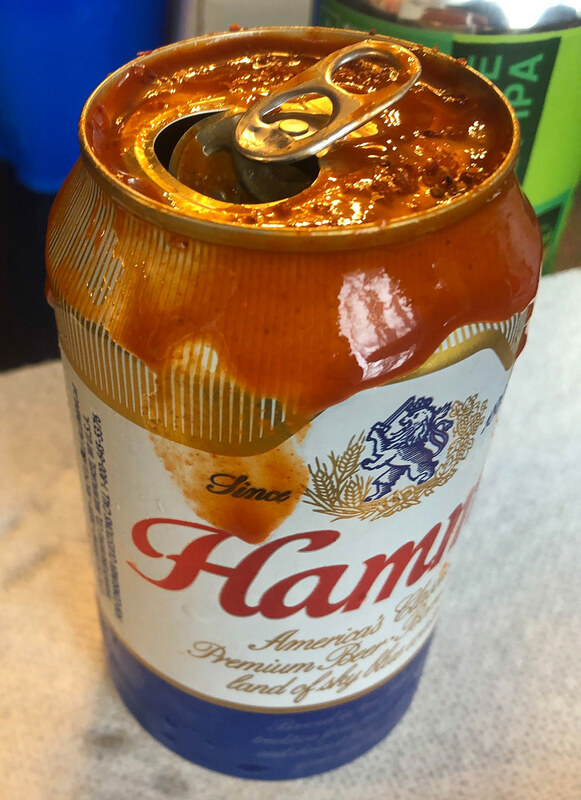 “Dressed Hamm’s” or “Spiced Hamm’s”? Have you tried one? They’re better than you thought, right? Did you have to look up Pardic Miner? Thanks for listening! We definitely believe that friendship and fun are the primary reasons to play Vintage, so we’re glad to make friends with our fans. If you want any advice about hosting a tournament in your own private space, invitational or otherwise, please feel free to reach out. We’ll look forward to any questions or comments here or The Mana Drain or on Twitter. You can also email us at seriousvintagepodcast@gmail.com.